Dean Ager is an award-winning performer and an outstanding Michael Bublé singer. He is well established and respected for his brilliant Michael Bublé tribute show. Dean's entertaining show captures Michael Bublé's personality, his charm, and his dynamic energy. The Michael Bublé show is very exciting for Bublé fans young and old. The Bublé show has a mixture of great Rat Pack swing classics like That's Life and Mac the Knife, to show-stopping revamps Cry Me a River, Feeling Good, and Fever. Dean blends classic dance favourites like Crazy Little Thing Called Love and Sway, with the modern pop gems Everything, Hollywood, and Haven't Met You Yet, and includes beautiful new ballads like Home, to name a few. View his video, and listen to his music clips, and you will quickly appreciate why Dean is simply the best around. Dean is a top-notch professional and Michael Bublé tribute artist and one of the finest that you'll ever see! Dean can even entertain you into the night with his professional disco and DJ skills. 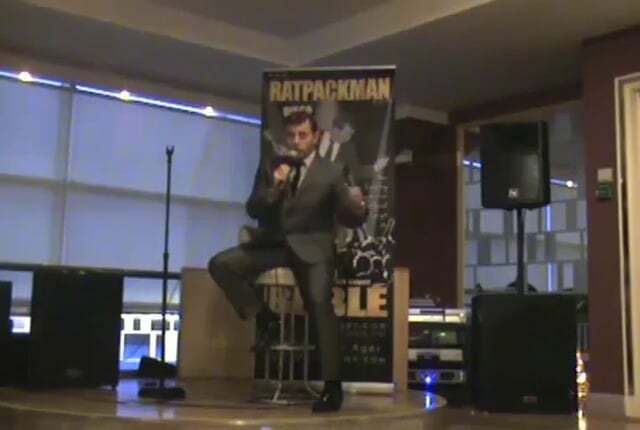 Unlike other Michael Bublé impersonators, he doesn't just sit in the corner and sing all night. On the contrary, Dean has an outgoing and confident personality and he enjoys mingling with the audience just like the great showman does himself. It is not just the ladies that fall in love with Dean's Bublé show - Dean has a witty and comical personality that is guaranteed to entertain everyone in the room. Dean Ager is the perfect choice as a Michael Bublé wedding singer, and for other events of all sizes and styles. Contact us now for all booking enquiries. Michael Steven Bublé born 9th September 1975 is a Canadian vocalist, songwriter and actor. He is a 3 time grammy award winner and with multiple juno awards too. Son of a salmon fisherman Michael was born in Burnaby, British Columbia in Canada. Bublé dreamed of becoming a famous singer. When he was a teenager, he slept with his Bible and prayed to become one. It wasn't until he was 13 that his parents realized his true talent whilst singing along to White Xmas. Bublé is a keen ice hockey fan and skater and wanted to turn pro before his passion for music. Michael won his first talent show at 18 and struggled to gain any recognition, singing in bars , pubs, clubs, on cruise ships, restaurants and even performing as a singing santa. Bublé's first national TV performance was on a 1997 award-winning Bravo! documentary titled Big Band Boom. In 2000, Bublé's career breakthrough came when an aide to former Prime Minister Brian Mulroney, Michael McSweeney, saw Bublé's performance at a business party and received a copy of Bublé's self-financed independent album. McSweeney showed the album to Mulroney and his wife and Bublé was invited to sing at the wedding of Mulroney's daughter Caroline, where he sang Mac the Knife. At the wedding, Bublé was introduced to David Foster, a multi-Grammy Award-winning producer and record executive who had worked previously with artists such as Madonna, Brandy Norwood, Whitney Houston, Michael Jackson, Céline Dion, Barbra Streisand, Kenny G., Cher, Josh Groban, and Andrea Boceli. Michael Bublé's eponymous debut album, was released 11 February 2003 by 143 Records/Reprise Records. The album went to the top 10 in Canada, the United Kingdom, South Africa and reached No. 1 in Australia. Bublé appeared nationally on NBC television in the United States on the Today program on 14 February 2003. The album went Gold there. Then he began to tour all over the world to promote the album. Bublé appeared in the 2003 movie The Snow Walker. Also in 2003 he portrayed a lounge performer on an episode of Days of Our Lives. In 2004 he appeared as himself in Las Vegas. He found a worldwide audience with his 2005 album It's Time, and his 2007 album Call Me Irresponsible which reached number one on the Canadian Albums Chart, the UK Albums Chart, the U.S. Billboard 200 albums chart, the Australian ARIA Albums Chart and several European charts.